Can I get heated seats? Do I have to get a sunroof? Find out what you need to know about Infiniti features right here. Eco acceleratorAccelerator presses back when system detects an inefficient excess of acceleration, to train the driver to drive more efficiently. Can be turned off. Accelerator presses back when system detects an inefficient excess of acceleration, to train the driver to drive more efficiently. Can be turned off. Blind spot collision preventionSelectively applies the brakes to guide vehicle back into the original lane when detects that a lane change will cause a collision with a vehicle in the blind spot. Selectively applies the brakes to guide vehicle back into the original lane when detects that a lane change will cause a collision with a vehicle in the blind spot. Lane departure preventionBrakes lightly applied to help prevent the vehicle from inadvertently traveling out of its intended lane. Brakes lightly applied to help prevent the vehicle from inadvertently traveling out of its intended lane. Breeze modeVaries airflow from the climate control system to simulate natural breezes. Varies airflow from the climate control system to simulate natural breezes. Concierge Services - 4 year subscriptionTypically can help with hotel and restaurant reservations. Typically can help with hotel and restaurant reservations. Synthetic suede headlinerUsually also includes synthetic suede on the pillars. Usually also includes synthetic suede on the pillars. Wood trim, alternative typeReal wood trim on instrument panel, door panels, and/or center console. Adaptive dampers - mechanicalShocks mechanically adjust firmness based on direct road inputs. Not driver adjustable. Shocks mechanically adjust firmness based on direct road inputs. Not driver adjustable. Rear wheel steeringThe rear wheels steer to improve steering responsiveness at high speeds and reduce the turning circle at low speeds. The rear wheels steer to improve steering responsiveness at high speeds and reduce the turning circle at low speeds. 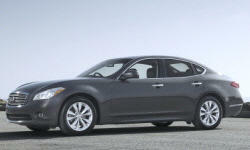 None of our members have yet commented on the available features of the 2013 Infiniti .